The Harry Fredrickson Family. 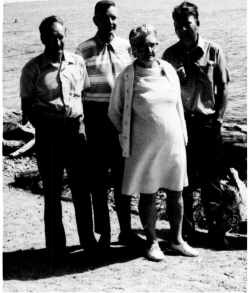 Douglas, Melvin, Olga and Robert. Robert Johnson, son of Anders and Beda Jansson, and Astrid Maria, daughter of Ole and Anna Skoglund, were married at Hilltop, Manitoba on August 22, 1941. They farmed the Johnson family farm until 1948. During that time three children were born to them. On June 22, 1942, Joyce Beda delighted her parents with her arrival. Judith Marie followed on April 20, 1945, and on August 9, 1948, Elwood Paul completed the family. III health forced Robert to move his family from the farm to an acre of land half way between Hilltop Baptist Church and Hilltop School. The four roads that met at that spot became known as "Robert's Corner". Robert took up painting and wall-papering and with Astrid provided a secure and loving home for their children. Both Robert and Astrid served many years on the school board as secretary-treasurer. The whole family was in­ volved in the school, church, and general community life of Hilltop. Robert's health led to his early retirement from the working world. In 1961, Astrid began her career in working with native children at Birtle, Manitoba. October 12, 1962, brought great sadness to the family when Daddy died. The following fall, Astrid moved her family to Birtle. Joyce graduated from St. Boniface General Hospital as a registered nurse in 1963. She married Henry Lucy in September, 1964. They live in Winnipeg and have two sons; Wendell Robert born on May 28, 1967, and Warren William born on April 29, 1968. Elwood graduated from the University of Manitoba with a Bachelor of Arts. He began his career as a parole­ probation officer in Kenora, Ontario. He married Marlene Brinkam in July, 1975, and they live in Peter­ borough, Ontario. Their daughter, Lisa Lynn was born on July 2, 1976, and son, Timothy David was born on September 29, 1979. Elwood continues in social work and is the only member of the family to carryon the name. In 1967, Astrid moved from her position as matron at Birtle Indian Residential School to the same position at Cecelia Jaffrey Indian Residential School at Kenora, Ontario. There she met and married Maurice Thomas Godin. Despite being spread across many provinces, the family gets together often and recalls with fondness their life on Robert's Corner. Although formal education for the Jansson family was limited - particularly for the older members, they all managed to learn to read and write fluently in two languages, something that their descendants with their high school and university educations have found dif­ ficult to do. If we fill our hours with regrets over failures of yesterday, and with worries over tomorrow, we have no today in which to be thankful.